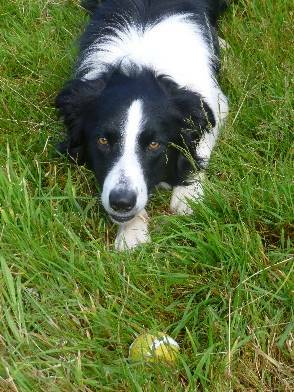 We survived last year’s avian flu scare, only to lose most of our ducks to fox attacks. 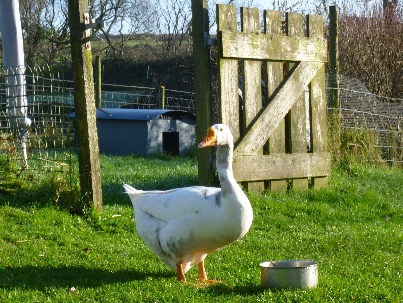 The last of which claimed the life of my lovely charismatic gander, Jerry. He was vociferous, moody, cantankerous and sometimes downright scary, and I miss him every day. The summer saw the arrival at Tregathenan of Prudie, Demelza and Elizabeth – 3 Black Rock hens no longer wanted by a neighbour. They were soon joined by Lady Caroline and Verity. They have been laying well all through the winter – and we hope their efforts will continue in 2018 so that our guests will be able to sample their wares too. The biggest change at Tregathenan has been the closure of the B&B business. We opened Tregathenan House in Spring 2005 following a year’s renovations in the house. Each year, we served 800 or so breakfasts, and looked after so many lovely guests. However, the early mornings and the 24×7 commitments take their toll, and when Ian turned 70 this summer, we decided that it was time for semi-retirement – of a sort! 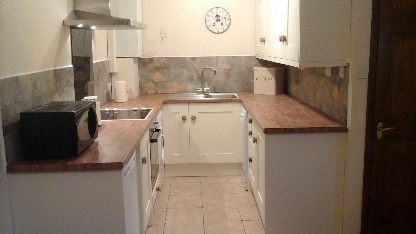 Work began in November to convert the kitchen and back of the house to make a cosy farmhouse kitchen with utility room, and a new energy-efficient heating system. 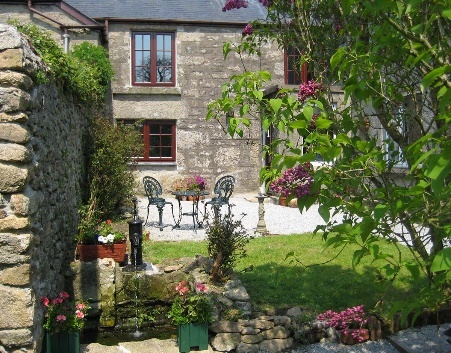 This spring Tregathenan House will re-open providing spacious self-catering accommodation for up to 6 people. There are many aspects of running the B&B that we will miss, not least the fun and laughter and banter with our many guests from many nations, many of whom have become good friends. We are considering using the services of a local agency to help us with our initial marketing of Tregathenan House, but you will also be able to book the property direct with us – by phone or email – as for the other cottages. We are also revamping our website, so look out for that soon. Maintenance and improvement works – continue every year. This year the Hayloft was re-carpeted throughout and we replaced the kitchen and the aged boiler in the Long Barn. The pointing project continues, this year it is the turn of the Granary and the Hayloft. There have been some eclectic cultural experiences this year. We were lucky with the weather to enjoy WildWorks’ production of Wolf Child in the grounds and woodlands of the Trelowarren Estate – a hugely impressive and convincing work. In September, Liz re-discovered her youth and bopped along to Stranglers and Bad Manners as part of the Bands in the Sand series at the Watering Hole on the beach at Perranporth. It was an amazing venue, but so vulnerable to the elements. 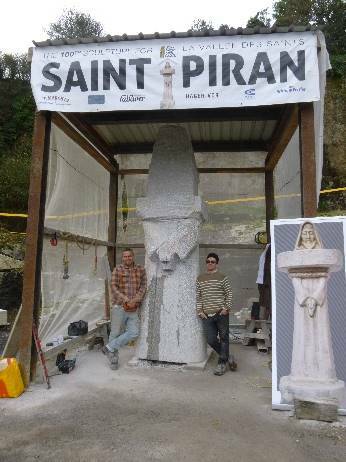 In November, Liz visited the Giant’s Crossing project – a 3.5m high sculpture of St Piran (Cornwall’s patron saint) which is to be transported by sea in July to La Vallee des Saints in Brittany to join almost 100 other granite saints in the sculpture park. In June, we celebrated Ian’s 70th birthday with a small gathering of friends and neighbours. 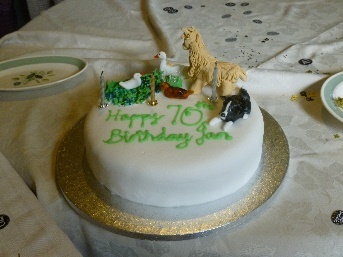 Our friend Annette provided some wonderful food and made this rather special cake. We had an eventful day trip to the Scilly Isles in September to help Liz’s brother celebrate his retirement. We sailed on the Scillonian III, a sturdy little ship with a flat bottom to help it get in and out of the harbour at St Mary’s, but which provides little in the way of stability in rough seas. The force 7 winds experienced on the way over became gale force 8 for the return journey and most of our time on the islands was spent looking for travel sickness pills. The Scillies are beautiful islands and we will return next time the sun comes out..! Ian continues to help provide eyes and ears on the coast and sea at the Lizard with his voluntary work with the National Coastwatch Institute (NCI). One of the benefits is that he gets to sit and watch the sea for 4-5 hours at a time and so gets treated to some very special wildlife displays including gannets, dolphins, seals and whales. Liz continues to enjoy her cycling and this year’s exploits have included the Cornwall Coast and Clay and the Eden Classic – a 62 mile ride around South Cornwall starting at dawn in front of the iconic biomes at the Eden Project. 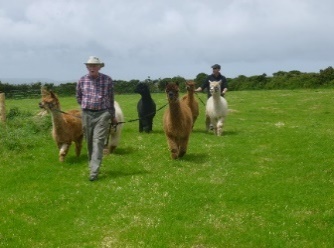 It is with great relief that we write, having just received news from DEFRA that our alpacas have tested negative for TB. It has been an anxious wait since they were tested on 28th December. This is the first time we have been required to test our boys – a sad reflection on how prevalent the disease now is around W. Cornwall. There would have been no right of appeal if any of the boys test positive. We finish this year’s newsletter on a sad note. In April we said goodbye to our lovely builder, David Freeman. Dave renovated Tregathenan House with us and was our ‘go to’ man for all our building projects, jobs and emergencies. Over the years, he wasn’t just the builder, but became a very special friend to both of us. We miss his knowledge, his wisdom and his sense of fun. We were lucky to have known him. All that remains is to wish you all a very happy and healthy 2018 and we look forward to seeing many of you back down in Cornwall this year.